Producers love chamber plays with small casts, unit sets and condensed running times: operating costs are low, but tickets prices don’t drop proportionately. Audiences seem to like them too. A ninety-minute running time and a cast of four somehow seems low-impact, easy to absorb, just the thing for a weeknight. So it’s remarkable that the hottest play of the season lasts well over three hours and has a cast of 21. 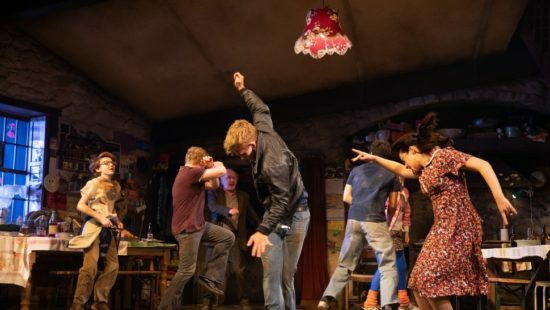 Usually musicals are the talk of the town, but this has been a miserable season for them in New York, so a number of plays have taken up the slack, foremost among them Jez Butterworth’s grand-scaled The Ferryman. First performed last year at London’s Royal Court Theatre and then on the West End, the play is now on Broadway with most of its original cast intact. It is a raucous family comedy, a melodrama of forbidden love, a political thriller, and a classic tragedy lamenting the sins of fathers, all in one. Set in Northern Ireland in 1981, at the height of “the Troubles,” as the sectarian strife that engulfed the region is known, The Ferryman concerns the Carneys, a large working-class Catholic family, and their attempt to escape the unbreakable cycles of violence that afflicted the region. Quinn Carney, a former IRA fighter, has escaped to a rural farm with his wife and seven children, two aunts and an uncle. Joining them is his sister-in-law Caitlin and her son. Quinn’s brother Seamus, Caitlin’s husband, has been missing for ten years. The play begins with the discovery of his body in a bog. After a brief prologue, the action takes place entirely in the great room of the Carneys’ farmhouse, a setting magnificently designed by Rob Howell and superbly lit by Peter Mumford. Howell and Mumford’s work is crucial to the play’s sense of an entire life being lived on the stage. The large cast also helps, as does the much-noted presence of real animals (including a goose and several rabbits) and a real baby (impeccably well-behaved at the performance I attended). The first of three acts opens with Quinn and Caitlin chatting in the early morning hours, before the house awakes. They debate pop music (Rolling Stones vs. Beatles vs. Led Zeppelin) and dance together a bit, knocking over a lampshade which catches fire, an incident so realistic I was at first convinced it was an actual accident. Surely this is a couple in the thrall of intimate, intense love, you think, but Butterworth slowly complicates that assumption. Quinn’s wife Mary has retreated from the family’s daily life due to an unspecified “virus” that is almost certainly depression. Any connection between Quinn and Caitlin remains as yet unacknowledged and is, in any case, quickly subsumed in the multiple currents riling the family. The preparation for the annual harvest plays out against radio reports of dying hunger strikers. Aunt Pat, a sharp-tongued, fanatical republican, spars with garrulous Uncle Pat (their same names a whimsical touch) and eyes the family’s neighbor, an English-born handyman, with suspicion. Pat and Pat’s memories go back to the 1916 uprisings that launched the modern Republic of Ireland, and their frequent evocation of a brother lost in that struggle is just one example of the action’s many unseen presences. Also presiding —visible, yet invisible—is Aunt “Maggie Far Away,” deep in dementia. She sits at the side of the stage, present for almost the entire running time of the play, forgotten by the family and the audience excepting those few moments when a memory struggles out of her and she briefly regains a fragile lucidity. Each subsequent act opens with a small group of family members that gradually expands to the larger group. The family’s many daughters pull a quasi-fable out of Aunt Maggie at the start of Act 2, and the family’s two teenage sons, joined by their cousins, the three Corcoran boys, drunkenly wrangle at the start of Act 3. These cousins, recruited to help with the harvest, enter the action only halfway through, but the oldest, Shane, plays a critical role in the final narrative crisis. Repeatedly, Butterworth introduces characters and even ideas and themes that seem ancillary at first and then become startlingly central. The prologue features Father Horrigan, a weak-willed priest, and Muldoon, a coolly terrifying IRA chief, but their connection to the Carney family only gradually becomes apparent. The discovery of Seamus’ body has political repercussions, and Muldoon threatens the family if they don’t keep silent. Butterworth plays out this conflict in multiple ways, but by the third act he foregrounds the personal implications for Quinn and Caitlin. Caitlin, the character at the heart of the play, is played by the luminous Laura Donnelly, who happens to be the real-life partner of the playwright. Butterworth was inspired by Donnelly’s family history: her uncle disappeared during the Troubles, and his body was only recovered years later. Donnelly’s rich performance would dominate most ensembles, but here she is just one member of the strongest large cast in a Broadway production in years. Other standouts include Dearbhla Molloy as the poisonous Aunt Pat, Stuart Graham brilliantly underplaying Muldoon, Fionnula Flanagan as the ultimately sibyllic Aunt Maggie, and Tom Glynn-Carney as the conflicted, hot-headed Shane. Paddy Considine has perhaps the largest challenge in playing Quinn, who drives the narrative but is somewhat under-characterized. I wanted a slightly more galvanizing central figure, but the fault lies with Butterworth, not with Considine who is electric. The play’s title refers to the mythical Charon, and the reference does not feel inflated. Born in the tradition of Irish political family dramas like Seán O’Casey’s Juno and the Paycock and Brendan Behan’s The Hostage, The Ferryman transcends even these formidable influences and becomes a truly universal tragedy, grounded in a thousand brilliantly observed details. It’s particularly gratifying to see the director, Sam Mendes, return to form. His London stage productions in the late 1980s and early 1990s, particularly at the Donmar Warehouse which he helped launch, promised great things. Then he went Hollywood with mixed results: an Academy Award for the overrated American Beauty and box office success for the underrated James Bond flick Skyfall. Much of his recent theater has felt rote, but his work on The Ferryman is intensely gutsy and vital. Elaine May in The Waverly Gallery. Photo by Brigitte Lacombe. Family drama on a significantly smaller, more quotidian scale played out in the season’s other standout, the revival (and first Broadway production) of Kenneth Lonergan’s The Waverly Gallery, his 2000 play exploring the effect of Alzheimer’s disease on a vibrant elderly woman and her family. 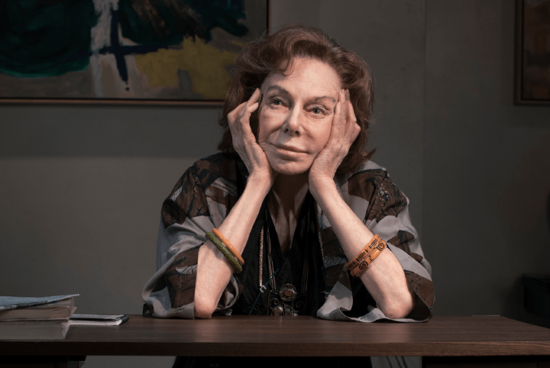 In the original off-Broadway production, Eileen Heckart played Gladys Green, a quintessential 80-something New Yorker of her generation: cultured, liberal, opinionated, talkative. Gladys runs an art gallery in Greenwich Village. The play depicts her gradual decline into dementia and the agonizing consequences for her family, including her daughter Ellen and Ellen’s son Daniel, who lives in the same building and suffers through frequent 3:00 a.m. poundings on his door from the confused, distracted grandmother he loves but grows to resent. Director Lila Neugebauer keeps everything at a very low boil in this ultra-naturalistic work. The performances feel lived but never heightened, in contrast to the vivid theatricality of The Ferryman’s cast. Neugebauer prefers to let the text play out dispassionately. Fortunately, Lonergan’s work is, as always, fastidious in its depiction of gradations of conflicting emotions: anger, frustration, devotion, resentment, concern, bemusement, love. He is a master of the deep undercurrents that inform familial relations, especially in extreme situations. Lonergan’s dialogue seems both believable and richly resonant, although the play’s construction is less felicitous than his more mature works, particularly his two recent films, Margaret and Manchester by the Sea, both models of emotional architecture. The Waverly Gallery suffers from a flattening of the trajectory in the play’s second half when several scenes seem to tread water. The use of Daniel as a fourth-wall-breaking narrator also seems pedestrian, although the young actor Lucas Hedges handled the transitions from diegesis to mimesis gracefully. Hedges was nominated for an Oscar for his performance in Manchester by the Sea and is fast becoming ubiquitous in contemporary independent films. His stage chops are apparent as he held his own with the more experienced members of the cast, including Michael Cera as an artist taken under Gladys’s wing, the brilliant stage director David Cromer in a rare acting turn as Daniel’s stepfather, and the distinguished actress Joan Allen, quietly heartbreaking as Ellen. This excellent cast was merely window dressing, however, for the signal theatrical event of the fall season, the return of the legendary Elaine May as Gladys. The Waverly Gallery played at Broadway’s Golden Theater, the very same theater where, 58 years earlier, May headlined in the fabled An Evening with Mike Nichols and Elaine May. Nichols and May (via LP, television, and radio amplification) helped reinvent comedy in the middle of the last century, effecting a transition from gag-based, ethnic jokes to today’s cerebral, observational humor. Without Nichols and May, there is no Bob Newhart, Lenny Bruce, George Carlin or Jerry Seinfeld. Since then, with the exception of a few memorable screen appearances, May has lived largely behind the scenes as a sporadically active writer and director, so her reemergence in a starring theatrical role at the age of 86 is nothing short of astounding. At first, I wondered if her slightly dithery quality and slurry diction was as much a function of the actress’s current capabilities as it was an acting choice. Quickly, it became clear that May held the role in an iron grip. Lonergan demands that the actress playing Gladys delineate a very specific progression over the course of the play, and that requirement, along with acres of dialogue, makes the role unplayable by anyone who isn’t in total control. May dominated the stage, much as her fellow octogenarian Glenda Jackson did earlier this year in the Broadway revival of Three Tall Women. Glenn Close and Grace Van Patten. Photo credit: Joan Marcus. 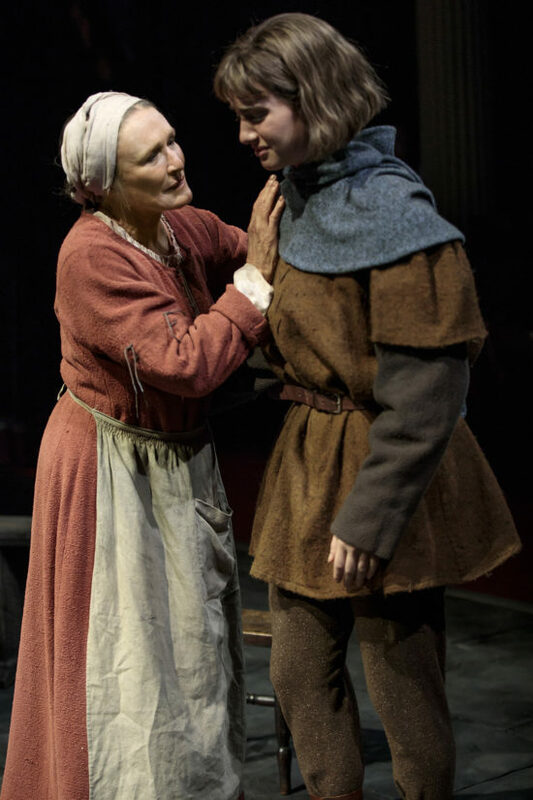 Down at the venerable Public Theater, Glenn Close, a mere 71, performed a similar feat of stage theft in the compelling new play, Mother of the Maid by Jane Anderson. Anderson, the screenwriter for Close’s concurrent film The Wife, significantly rewrote the work following its world premiere in 2015 at Shakespeare & Company in the Berkshires. The well-known saga of Joan of Arc is here told through the eyes of her mother Isabelle, an earthy, redoubtable, uneducated but cunning peasant who must come to terms with her daughter’s fame and then her sacrifice. It’s a potentially gimmicky approach, and much of the first half of Mother of the Maid draws its energy from a winkingly modern take on how a nervous mother would respond to a troubled, imaginative daughter. Joan is having religious visions? She’s just tired; a good night’s sleep will set her to rights. Joan feels inexplicable stirrings that she can’t comprehend? Well, dear, all teenage girls find themselves with strange new desires; let’s talk about sensible birth control. The play soon deepens, though, and if it’s never profound, it is certainly engrossing. It feels like a throwback to the kind of intimate historical dramas that used to provide Broadway showcases for beloved actresses like Helen Hayes and Julie Harris. Mother of the Maid is not revisionist. Anderson draws on neither contemporary politics nor cutting-edge aesthetics. There are anachronisms in the text—enough to indicate intention—but the dialogue clearly conveys a naturalistic objective, an attempt to capture the flavor of medieval peasant-speak. The show feels grounded in the practical realities of medieval life and in a vivid sense of the distinctions between country and castle. Some of the best scenes show Close’s Isabelle in Orléans at the court of the Dauphin, interacting with a sympathetic but alien aristocracy; she’s the embarrassing country bumpkin relative whom Joan both loves and barely tolerates. The real gift of Mother of the Maid was the opportunity to see an actress of Close’s skill and renown in an intimate setting. Her perfor­mance as Isabelle was fantastically meticulous, yet also bravura, unafraid to be bold, to fill the small theater with her heat. Last seen in New York in the misbegotten revival of Andrew Lloyd Webber’s cheesy Sunset Boulevard, the actress has a tendency to teeter on the brink of excess. Here her carefully honed skills sketched a performance that was both huge and authentic. Her physicality captured the bone-weary move­ments of a woman who had labored an entire lifetime. And her frightened, frantic reactions to her daughter’s final catastrophe were harrowing. Close was ably supported by Grace Van Patten as Joan and Dermot Crowley as Jacques, Joan’s father. The story of Joan has been catnip to dramatists for centuries, but the Public’s most recent foray, the 2017 David Byrne-penned rock musical Joan of Arc: Into the Fire, was so terrible that I could only admire the company’s determination to get back on the horse. 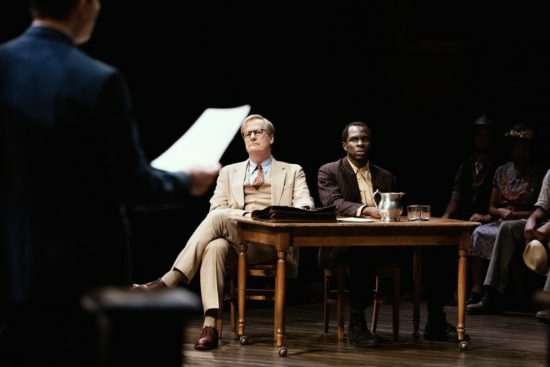 Jeff Daniels as Atticus Finch and Gbenga Akinnagbe as Tom Robinson in To Kill a Mockingbird. Photo by Julieta Cervantes. Back on the Main Stem, the fall season’s final new production was a production as epic in scale as The Ferryman: the long-aborning, much debated new theatricalization of Harper Lee’s immortal To Kill a Mockingbird. Stage versions of the novel have been around for decades, but this is, surprisingly, the story’s first appearance on Broadway and, for the occasion, producer Scott Rudin commissioned a new adaptation from Aaron Sorkin, the brilliant writer behind The West Wing and The Social Network. As has been well documented, the Lee estate was not happy with the initial results and, earlier this year, sued to shut down the production. Rudin countersued and even offered to perform a staged reading of Sorkin’s adaptation in court (a stunt worthy of the late producer David Merrick). Ultimately, Rudin and Lee’s estate settled the dispute and, millions of dollars of free publicity later, the show has opened with a massive advance sale, a guaranteed smash hit. Back in the summer, my sympathies were with the stage folk whom I thought were righteously battling a myopic, conservative guardianship that didn’t understand that books and plays had different requirements. Now I’m not so sure. What is up on the Shubert Theatre’s stage feels much more Sorkin than Lee to me, and not in a good way. Sorkin at his best is hyper-intellectual, witty, passionate; at his worst, he is pontificating and self-righteous. Neither extreme occupies the same universe as Lee’s plainspoken, gently dignified characters and her quietly complex social justice analytics. Throughout this production, I heard the powerfully characteristic Sorkin tone not just in the mouth of Atticus Finch, the hero and protagonist, but in the mouths of his children and even some of the supporting characters. It didn’t help that Finch was played by Jeff Daniels, exciting as always, but an actor born to speak Sorkinese. His every moment on stage was compelling yet not at all evocative of how I had always imagined the character. This Atticus spoke in fervent, angrily virtuous paragraphs, and his takedowns of the bigoted villains were in a contemporary, smart-alecky mode that was both rousing and all wrong. I also felt too aware of Rudin and Sorkin’s attempts to manufacture relevance. The role of Calpurnia, the Finches’ African-American house­keeper, has been significantly expanded and cast with a heavyweight actress, LaTanya Richardson Jackson. She becomes an outraged, proud voice of her community—a voice which is undeniably not all that audible in Lee’s novel. Calpurnia argues with Atticus over the limits of civility and the need to be angrily uncivil when faced with social injustice—a particularly 2018 debate. She also pointedly asks why a black character needed to be shot multiple times by the police when one bullet would have sufficed. Similar expressions of social outrage are expressed by Tom Robinson, the wrongly accused African-American man whom Atticus defends, and by Atticus’ own children. My problem is not with these sentiments, which all lie at the heart of Lee’s story, but in the forced, awkward way in which they are pasted onto the characters and the narrative, as if Rudin and Sorkin didn’t trust an audience to take the right side and glean the proper modern relevance without heavy-handed signposts. The production by director Bartlett Sher, fluid and physically impressive as usual, also falters in a central casting strategy. The three young children through whose eyes the story is told, Scout and Jem Finch and their next-door neighbor Dill Harris, are all played by adults. The device is conceivably justified by a “memory play” prologue, but in practical terms the result only worked for me in the case of the wonderful actress Celia Keenan-Bolger, who brings a wide-eyed, heart-clutching sincerity to Scout, the most critical role. On the other hand, Will Pullen, as Jem, and Gideon Glick, as Dill, can’t get past the awkward­ness of pretending to be pre-teenagers. Glick, in particular, was at times cringe-inducing, and the decision to make him seem queer in an almost adult sense felt like an over-obvious choice made just because Dill was based on Lee’s childhood friend Truman Capote. The supporting cast, including Frederick Weller as the villainous Bob Ewell, Dakin Matthews as an avuncular Judge Taylor, and Erin Wilhelmi in a harrowing performance as Mayella Ewell, were all excellent. To Kill a Mockingbird is of course an unfailingly powerful and moving story, and in many scenes this production delivered. The trial is gripping, and the relationship between Atticus and his children is moving. Famous moments, like the mysterious appearance of Boo Radley behind the door, worked their magic. But the production was compromised from the start by the mismatch of writer and subject.